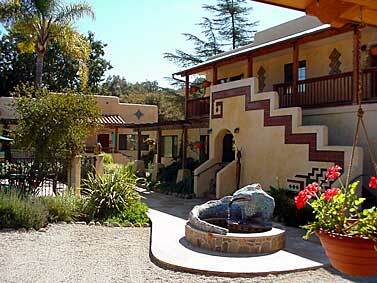 The Blue Iguana Inn was designed and built by renown Ojai Architect Marc Whitman, of Whitman Architectural. It is built in an old mission style reminiscent of old California and Mexico: arched entrances, terra cotta curved roofing and rugged outpost railings. Large Ojai river rocks tumble and set corners. Flagstone paths are marked with intricate inset stone designs and exquisite hand-made Mediterranean tiles created by celebrated Ojai artist. ach room is uniquely furnished with hand chosen authentic Mexican furniture and decorated with rugs and accessories from throughout the world. For your comfort all our rooms are spacious and feature expanded channel color televisions, telephones w/ free local calls, refreshment bar, coffee makers and, of course, air-conditioning. In-room message is also available upon request. This and other Ojai Bed and Breakfast Inns can be found here in The Register.